The right to kill? I’d rather the right to die. This is old news, but my sister recently watched the video; Collateral Murder, released by wikileaks showing US soldiers opening fire on some men in Baghdad in 2007 from Apache helicopters. Two war correspondents from Reuters were in the group and their cameras were mistaken for weapons. Wikipedia as an entry on the incident. In the video, which Reuters has been asking to see since 2007, crew members can be heard celebrating their kills. “Oh yeah, look at those dead bastards,” says one crewman after multiple rounds of 30mm cannon fire left nearly a dozen bodies littering the street. Two crewmen share a laugh when a Bradley fighting vehicle runs over one of the corpses. I watched the video and it’s pretty horrifying and depressing how the soldiers are eager to open fire; how nonchalant they are about the bodies on the ground (and being the cause of them) or even about having opened fire on children. And yet… why were people outraged, why was this a big deal? Only because of the cover up, the fact that the men were reporters and the fact that there were children, right? What if the men hadn’t been war correspondents, what if there were no children? Then… ‘Meh, it’s a war. What do you expect?’? Exactly. What do you expect? You give soliders deadly weapons and you train them to kill; then fault them for not having compassion? You train them to do a job and then fault them for taking pride in executing a nice shot, fault them from wanting to finish the job, fault them for taking deaths in their stride? When we see the footage with the knowledge of what happened and imagine things from the point of view of those on the ground… imagine carrying your camera walking down the street in a group. No conflict or battle in sight, you’re just making your way from one place to another. Suddenly, bullets rain from the sky. Your friends or colleagues drop like flies around you, you try to run. But the shooting doesn’t stop until everyone is dead on the ground. Nothing you could have done, no where you could have hid. Sitting ducks. Over in seconds. Imagine you’re the driver of the van, with your kids with you. You see wounded people on the floor. If you don’t help, they’re sure to die. So you stop, and pay for it with your life. Try it from the soldiers point of view; can you really blame them? We’re in a war. Our job is to spot threats. We see weapons, we see trouble, we shoot. When you see men on the street, you don’t stop to wonder who they are or if they have kids or if they miss home like you do. You’re not suppose to empathize with people you’re might have to kill! So men in wars aren’t human? Men in war don’t have wives, families, children? They don’t have lives? They don’t have feeling and emotions? If you’re in a war, life isn’t precious? Somehow ‘war’ makes all this violence okay and acceptable? It makes me think of Gandhi and the Gandhi movie I watched a several months back. (Read about that here.) While I really admire him and his philosophy, I couldn’t help but feel that maybe it really wasn’t the smartest or best way to do things, as noble as it sounds. The scene where they just walked up in neat rows to be struck down by the guards again and again and again, especially. You can make being in a army and fighting for your country sound as glorious and noble as you like. Use words like duty and honour; bravery and sacrifice. But at the heart of it, weapons are tools made to destroy and kill. And armed forces consist of men trained to effectively wield those tools. A killing machine. 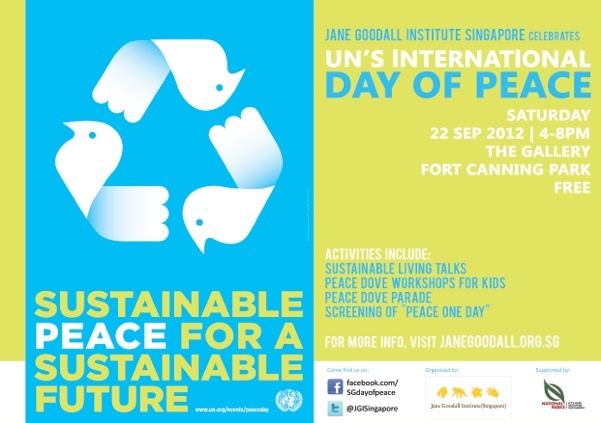 Something a little more current: It’s apparently World Peace Day in 3 days time, on the 21s of September, and that’s being celebrated here in Singapore at Fort Canning from 4-8pm on the 22nd of September. I’m all for peace but I’m just wondering how much of this is lip service and abstract, feel-good, vague support. I hope people who support and attend think about what they mean by peace in more a more concrete sense– it’s easy to say you support peace over violence– who doesn’t? But what exactly do you mean by it? When is violence acceptable? I support peace… EXCEPT for criminals on the death sentence? I support peace… EXCEPT when in a war? I support peace… EXCEPT in self-defense? Or a truly Gandhi-type peace, where violence is NEVER okay? no heaven, no hell. no countries, no religion. no possessions, no greed, no hunger. People champion the right to kill for honour, duty, safety and other ‘greater goods’. What about the right to die for peace?